Business card printers of full colour business cards printed and delivered to Scotland at very competitive printing rates. Fast online full colour business card printers of high qualitybusiness calling cards at low printing prices. We accept all major debit and credit cards. American Express cards, bacs and Pay Pal transactions. For a fast print quote. Paying for your printing could not be simpler as we accept bank transfers, company cheques and all major debit and credit cards, Pay Pal and American Express cards. UK nationwide card printing service with online prices. We supply business cards throughout the United Kingdom. All business card printing prices include delivery. We use next day couriers to dispatch your print work. Business card printing at low prices for next day delivery to Scotland. Competitive low-cost full colour printing prices on either a fast 3 to 5 day print service, or a 7 to 10 day print service. Full colour one sided business cards, printed onto 400 gsm matt art board. 7 to 10 day printing prices based on supplied artwork. 3 to 5 day print prices.
! Beware of card printers who are printing onto 200 gsm paper not thick card ! Full colour two sided business cards, printed onto 400 gsm matt art board. How to upload pdf artwork for your a printed business or calling cards or commission our designers. If you click on a price that relates to the quantity and service that you require, this will start our secure online ordering system. Then you will be able to select the type of artwork service that you require. Supplied artwork. A free artwork checks will be carried out. Basic artwork. Our designers will create basic artwork from your supplied text and images. Premier artwork - Our creative design team will create an effective design and quality artwork for your business cards. Please consult our artwork guidelines, prior to supplying artwork as we only provide one free artwork checks on PDF files that have been correctly supplied. Free business calling card artwork checks or low-cost design and artwork. We include a free artwork checks to ensure that your supplied PDF will be okay for printing. When you place your first order you will be granted access to your own client area that will allow you to monitor your job, download invoices and view artwork proofs. You will also be able to buy future print work, clothing and signs with a 5% loyalty discount. To send your PDF artwork or to send an artwork brief to our creative team you can e-mail files up to 10 mega bytes. Alternatively you can use our file transfer server. 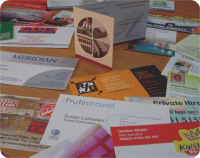 We offer a competitive nationwide business card printing service to and the rest of the United Kingdom. Fast UK based printers offering a high quality full colour litho printing service. Subject to our terms & conditions. Competitive Printing Ltd © 2014 Terms & Conditions.